Earlier, I wrote in this post my suggestions for how the Obama campaign could thrash Mitt Romney this fall. Thus far, they seem to be thinking along the same lines, and it’s working pretty danged well. We have the debates coming up soon, which are Romney’s very last, hail-Mary chance to gain any chance of winning. So I’ve been thinking about the debates. I was a successful high school and college debater, and a debate coach and argumentation teacher after retiring from competition. For what it’s worth, here is what I would do if I were in Obama’s shoes. 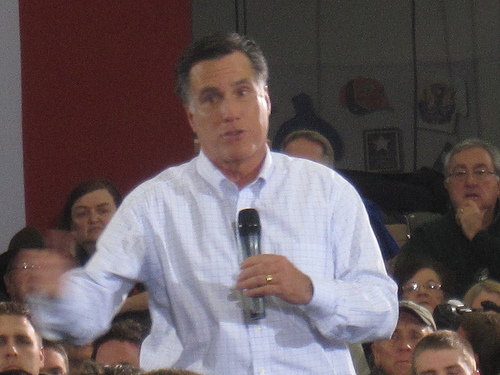 Keep bringing up–with dates and locations–Romney’s widely varying statements on the issues under discussion, and seeking to clarify how these fit together or which of them he has settled on. In other words, tacitly question his veracity and trustworthiness. Frame Romney’s tax policies with the analyses showing they must inevitably lead to raising taxes on the middle class. Make him defend them. Make him explain again that “middle income” is $200-250K. Press for specifics in the places he refuses to give them, saying the American people deserve to know specifics to make their choice. Contrast with what he (Obama) has done in cutting taxes for 95% of Americans. Politely hammer on Romney’s desire to double down on failed Bush/Republican economic policies. Remind him and viewers of the facts on how these policies have screwed everyone but people like…Mitt Romney. If you really want to put the knife in, contrast this slavish devotion to trickle-down economics with Obama’s willingness to consider ideas from the other side of the aisle…like Governor Romney’s health care initiative in Massachusetts. Show viewers the warmth Romney is incapable of mustering. Be sure to reference the suffering you’ve seen in person and in letters you receive. THAT is the reason you knew it was the right thing to save the automotive industry, restoring a flagship American manufacturing sector providing millions of jobs to profitability, instead of doing as Gov. Romney suggested and “letting Detroit go bankrupt”. Americans are hurting: fewer of them than were hurting in 2008, but far too many nonetheless. You get up every day thinking about how best to give people a chance to get back up on their feet. With the wealthiest richer than ever before, you can’t see any reason to believe that giving them even more money is going to help the situation of the people who write you those letters. Overall: stay cool and cordial–which will not be a problem for O-Cube–and methodically make Romney mad. Romney comes off as a snotty, insincere, awkward and entitled bully even at the best of times. But because he is accustomed to getting what he wants, he is thin-skinned. When he gets mad, his arrogance and assumption of entitlement go off the scale, and he becomes the classic Hollywood stereotype of the Sociopathic Rich Kid. You want America to see Romney being that guy. Romney is desperate, and he knows he needs to land some punches in the debates. So he’ll be overreaching with his swings, just as he did with the embassy attack debacle. Just bob and weave, wait for opportunities, and keep stinging him with small shots that contrast your achievements with his empty claims, your commitment to bettering the country with his opportunistic flip-flopping and self-interested policies. Get him steaming. Do that, and the man will defeat himself.